The Faroe Islands are an archipelago between the Norwegian Sea and the North Atlantic, about halfway between Norway and Iceland, 320 kilometres (200 miles) north-northwest of Scotland. The islands are an autonomous country within the Kingdom of Denmark. Their area is about 1,400 square kilometres (541 square miles) with a population of 50,322 in October 2017. 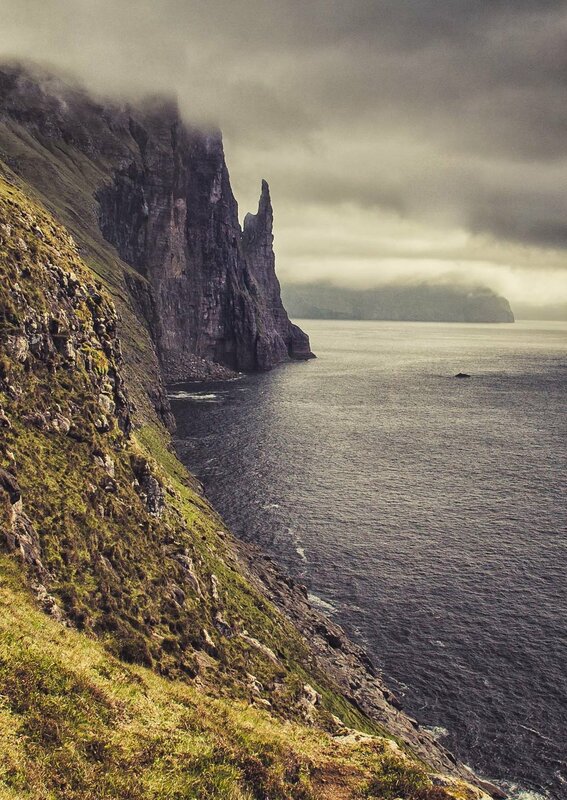 The Faroes' terrain is rugged, and the islands have a sub-polar oceanic climate: windy, wet, cloudy, and cool. Despite this island group's northerly latitude, temperatures average above freezing throughout the year because of the Gulf Stream. Between 1035 and 1814, the Faroes were part of the Hereditary Kingdom of Norway. In 1814, the Treaty of Kiel granted Denmark control over the islands, along with two other Norwegian island possessions: Greenland and Iceland. The Faroe Islands have been a self-governing country within the Kingdom of Denmark since 1948. The Faroese have control of most domestic matters. Areas that remain the responsibility of Denmark include military defence, policing and the justice department, currency, and foreign affairs. View down to Funingur photographed at midnight. 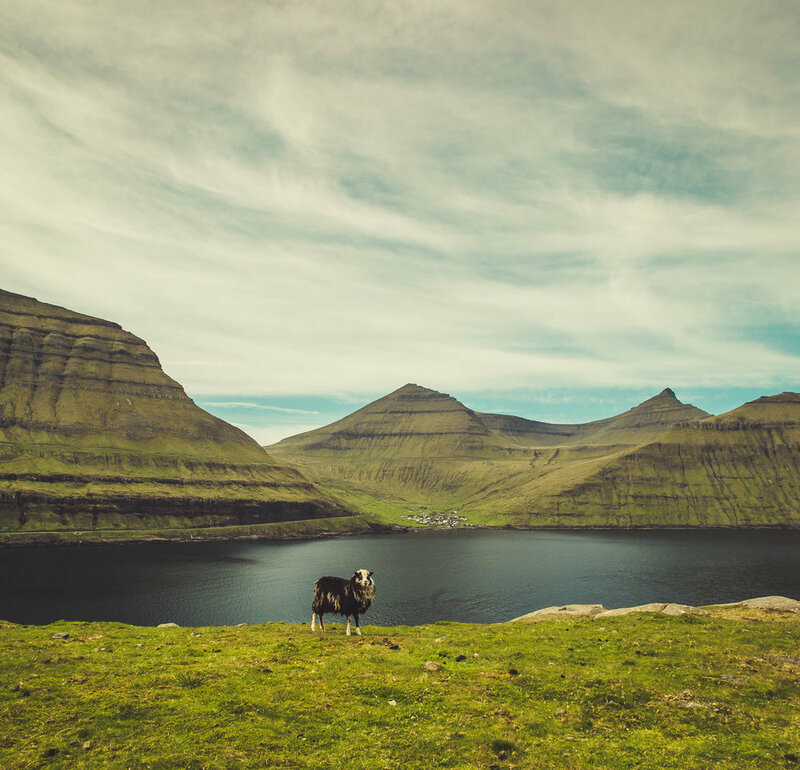 However, as they are not part of the same customs area as Denmark, the Faroe Islands have an independent trade policy and can establish trade agreements with other states. The islands also have representation in the Nordic Council as members of the Danish delegation. The Faroe Islands also have their own national teams competing in certain sports. Elduvík is located in the Funningsfjørður-inlet on Eysturoy's northeast side. The village which has a population of 23 is split into two parts by a small river. The church in Elduvík dates from 1952. Visible from Elduvík is the nearby island of Kalsoy. This was our base for two nights to explore the best landscape spots within 30 minutes drive. Our accomodation was in a grass roofed house and built over 200 hundreds years ago. 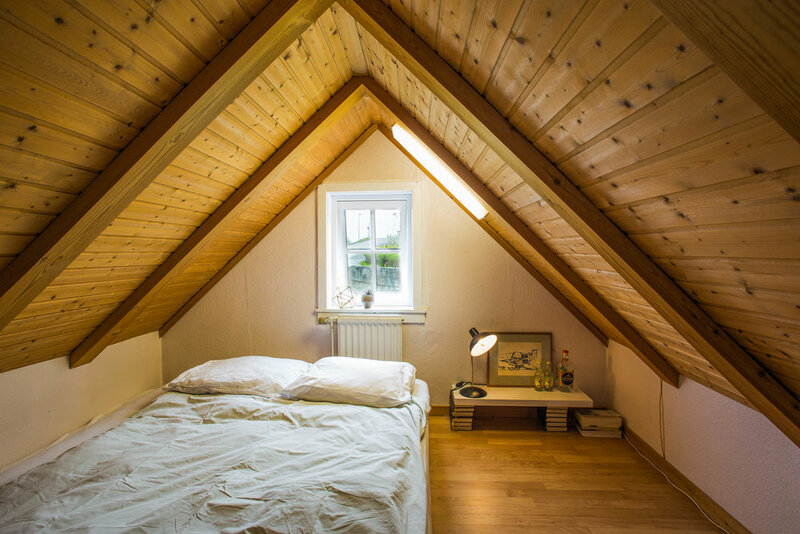 With recent renovations of the property it was very comfortable as seen in the pictures above. Click the image to see a slideshow. Funningsfjørður is a village located at the end of a fjord of the same name. 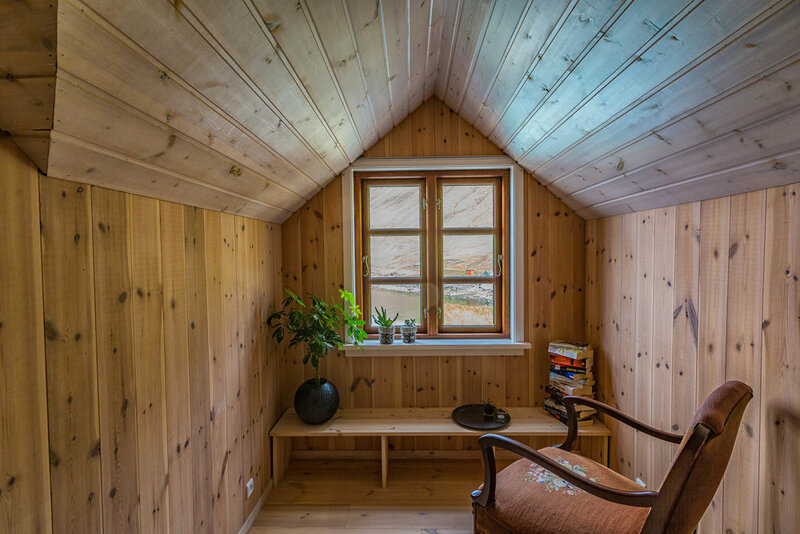 It was founded in 1812 and has since 2005 been part of the municipality of Runavík. From Elduvik its a quick 15 minute drive and on the way to other key locations 30 minutes away. Eiði is a village located on the north-west tip of Eysturoy, Faroe Islands. Its name means isthmus in the Faroese language. The town has a population of 669 inhabitants. Eiði was settled by Vikings in the 9th century AD. Just outside the village you can capture some great vantage points for a spectacular sunset. The drive into the valley is equally as spellbinding. Gjógv is a village located on the northeast tip of the island of Eysturoy, in the Faroe Islands and 63 km north by road from the capital of Tórshavn. If you are driving to Eidi you might as well have a quick look as it's only a 15 minute detour on the way back to Funingur. Gjogv at midnight in summer. The drive into Eiði before sunset was surreal with the clouds hanging low over Eiði lake. The sheep were extremely friendly and posed nicely for a sunset shot. Day 2 Viðareiði is the northernmost settlement in the Faroe Islands and lies on the Island of Viðoy, which belongs to the Norðoyar Region. From Elduvik it takes about an hour driving through various under ground tunnels that connect the islands. Viðareidis church is a stone church in Viðareiði built in 1892. 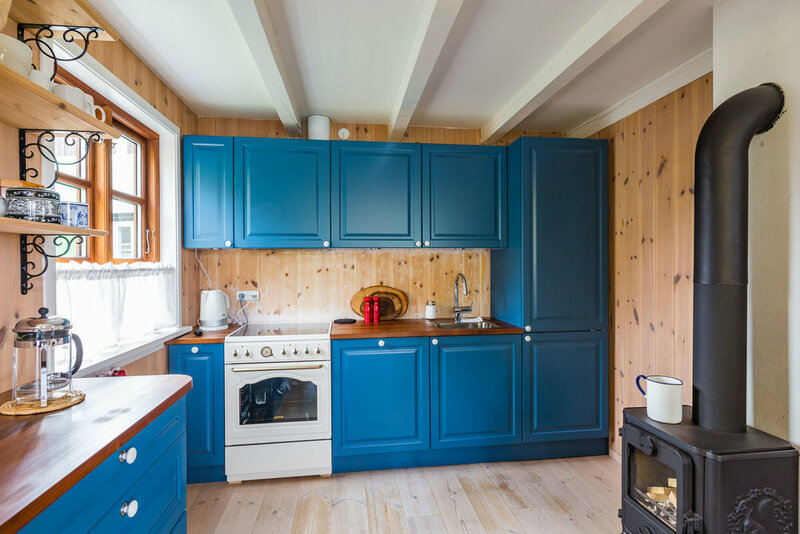 It is beautifully situated, overlooking the sea and towards Enniberg and Kunoyarnakkur. Despite not being able to see these two points because of cloud and fog cover the atmosphere of the area was eerie and calming. Calming because of the low tide and eerie because of the cloud and fog. The green grass is lush and has deep tones of dark olive. There are more sheep (70K) than people living on the islands. Since most islands are treeless and are elongated in shape, most roads run along the perimeter. You are never more than 5km to the nearest shoreline. It's main industry is Salmon Fish Farms which can be seen dotted everywhere. Lamb is also the main industry and all other food products are flown in daily from Denmark. At the local supermarket you find lots of fresh fruit and vegetables. Another fun fact about the sheep is their clever use as a tourist campaign to join forces with google maps. Attaching cameras to their backs we are now able to get some unique street and mountain views. On the way back to Elduvik we passed Hvannasund a village located on the west coast of the island of Viðoy. It faces Norðdepil on Borðoy. The villages are connected to each other by a causeway where the image above was taken. There are no traffic lights in the tunnels so when crossing over islands you might have one lane. Within the tunnels there are spots you can pull into while a car drives past. The capital of Torshavn has 3 traffic lights as this is where most people live (21K). Tórshavn, on Streymoy Island, is the capital city of the Faroe Islands. It's known for its old town, Tinganes, crammed with wooden turf-roofed houses on a small peninsula. When the roof meets the ground level sheep are used to mow the lawn. 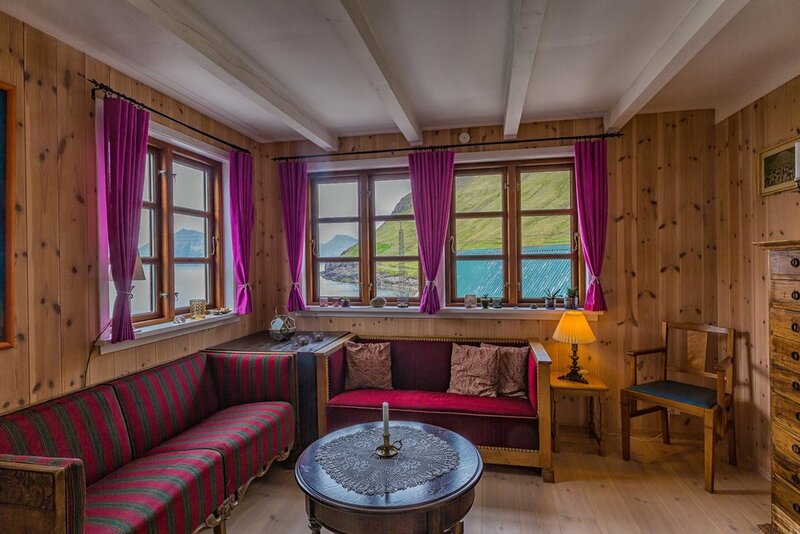 Staying in one of the these houses is a great experience when visiting the Faroes. On the 1st of June we happened to be in town for Cultural Night. All shops open till 11pm and many food stalls line the streets in festive ambience of community. Music is a big part of Faroese culture with many bands and indie artists performing at various venues. We stumbled upon a local talent called Jasmine at the Sirkus Bar. Our accomodation owned by a famous fashion designer called Gudrun & Gudrun was stylish and comfortable with a relaxing view of a small port in front of the cottage. Fog seemed to be engulfing the town for most of our stay as we heard fog horns blowing for most of the early morning. Torshavn Port in thick fog. 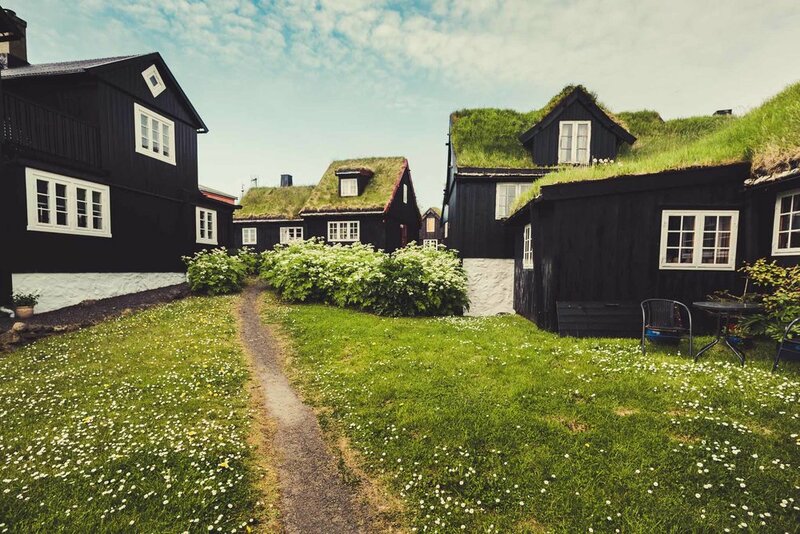 Sandavágur is a city on the south coast of the Faroese island of Vágar, and has been voted the most well-kept village in the Faroes twice. And it's the most famous city in the country, and best voted traveling experience. I stayed here the night and not quite sure if I missed something but it seemed just like any other town. The highlight of the area is photographing what is close by. 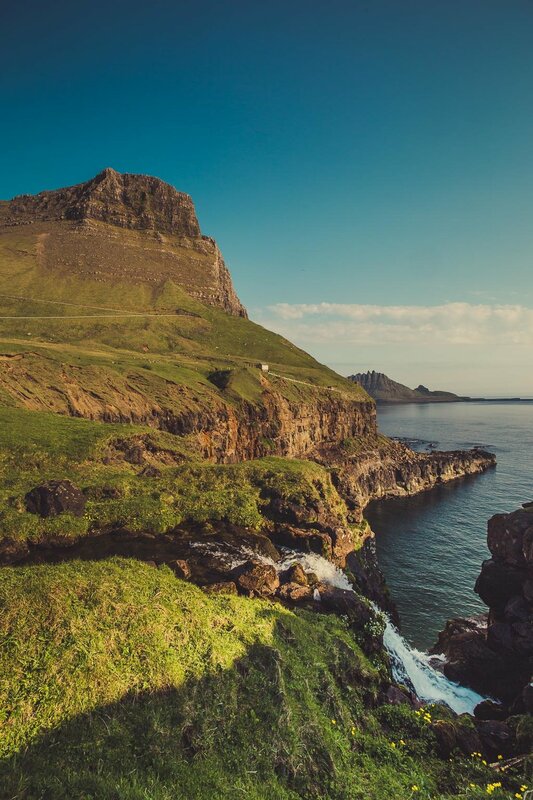 If you are looking for cascading waterfalls flowing into the ocean from cliff tops, then Gasadalur is only a 30 minute drive away. On the way there you will see the arch shaped mammoth rock and spike tops on the island next to it. Drangarnir is the collective name for two sea stacks between the islet Tindhólmur and the island Vágar in the Faroe Islands. The individual names of the sea stacks are Stóri Drangur and Lítli Drangur. If you wish to get a closer look at Drangarnir an 8 hour return walk is needed to get to the closest cliffs. The village of Bøur is a village in the Sørvágur Municipality of the Faroe Islands, 4 km west of Sørvágur, with a population of 75 is where you can get this view. The ferry pictured below is coming back from the island of Mykines where if you are lucky you can see puffin birds. From Bøur to Gandasalur is a 10 minute drive. They have recently marked the cliff top walk to the cascading Mulafossur Waterfall to avoid accidents. If some torrential rain has come and high tide is hitting the coastline you can get some atmospheric shots. We unfortunately had a beautiful clear blue sky day which is very rare. In the village of Sandavagur you can take short walk along the cliff face. On our final day on the way to the airport we crossed our fingers to hope for a break in the fog that had been covering the witches finger for 24 hours. Low and behold the for a brief moment we saw her for this quick shot. Reality VS Expectation: Unfortunately, the 4th day we attempted the 2 hour return climb to Trælanípan to view Sorvagsvatn Lake we had zero visibility with heavy fog. Despite waiting for an hour at the cliff top view this is all we saw. Have a look at this spot we missed out on from Mads Petersen video. If you wish to join me on a photo tour please send me an email to let me know which month works best for you. If you wish to join my next photo tour, please click this link for more info.